A varying terrain, fresh air and new smells make hiking a win-win activity for both you and your dog. Photography ©Dawn Celapino | Leash Your Fitness. A varying terrain, fresh air and new smells make hiking a win-win activity for both you and your dog. No matter where you live, there are most likely hiking trails. You may have to drive to them, but believe me, it’s worth it. Breathing fresh air, smelling the trees and flowers and walking on dirt instead of concrete is so good for your body and mind. Your dog will love all the new smells and, depending on where you go, the terrain may be a great addition to your exercise routine. Adding hills and stepping up on rocks is a great leg workout for both you and your dog. If you find a trail with a pond or lake for your dog to swim in, that’s even better. Swimming is such a great form of low-impact exercise, and there’s nothing better than a clean, freshwater lake for Fido to fetch a ball in. 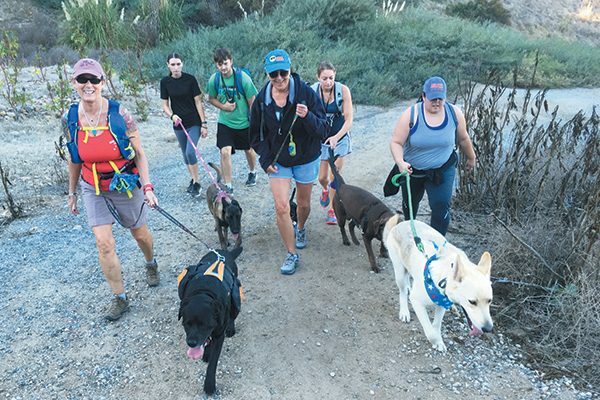 Equipment needed: Harness and 6-foot non-retractable leash that gives you control over your dog in case of other animals or obstacles on the trail; hiking pack with collapsible bowl, water bottle, treats, snacks, poop bags and small first-aid kit. Quick tips: First, check that the trail is dog friendly. Some national parks and state parks do not have dog-friendly trails. Ensure the terrain is safe for dogs. If your dog is only used to a walk around the block, a 5-mile hill climb may be too much at first. You don’t want rocky terrain that will tear up Fido’s feet. How’s the weather? Many hiking trails can get rather hot, so pick a cooler day and time of day. Will there be shade? Take plenty of water and a bowl. Dawn shows how her dog, Jack, uses his mental abilities, core muscles and balance to stand on the board with her. Photography ©Dawn Celapino | Leash Your Fitness. Speaking of water, have you tried stand-up paddleboarding with your dog? It may seem like it’s not much exercise for the dog, but it sure is. Not only is your dog using his mental abilities to sit, stand in place, lie down and stay, but your dog is using his balance and core muscles to stand on the board. It’s a great bonding experience for you and your dog because Fido must trust you to be in charge in this new environment. A bonus is the fact that your dog can take swim breaks and get a super total body exercise. Equipment needed: Harness and 6-foot non-retractable leash so your dog doesn’t swim away; stand-up paddleboard; personal flotation device for dog; waterproof phone case so you can take your cell phone safely; sunscreen (human and dog safe); hat. Quick tips: Get Fido used to the SUP on flat ground first. Use treats and positive reinforcement. Then start out in shallow water, and only go out for a short paddle the first few times so Fido will get used to the sensation of the board and water. Never take your dog on a SUP without a personal flotation device. Even if Fido is a great swimmer, the jacket will have a handle on the top to help get him back on the SUP in case he jumps off. During boot camp, you and your dog work together during separate phases of the class. Photography ©Dawn Celapino | Leash Your Fitness. Exercise classes for you and your dog are starting to pop up all over the country. They’re a great way to work together during different phases of the class. 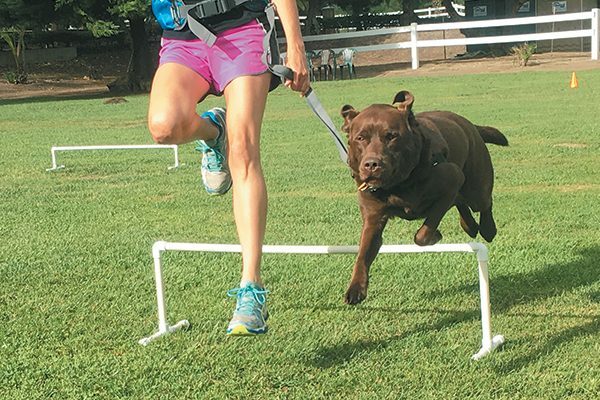 The cardio portion teaches your dog how to run alongside you and build endurance, and the weight-training portion gives your dog a chance to practice his dog obedience while waiting patiently. The dog obedience part is sometimes even more tiring for the dog who wants to run and play! Being still in a sit/stay is mentally exhausting for some dogs. Usually, if a dog has a lot of energy, a boot camp class is perfect. Your dog needs the structure to give him something to think about and do. A run or walk is great, but dogs need structure, and they need to use their minds to mentally tire them out. Equipment needed: 6-foot non-retractable leash; harness, as it is easier on the neck than using a leash and collar; front harnesses recommended for heavy pullers; bottle of water. Some classes recommend a yoga mat or towel. Quick tips: Find a class that has a good reputation for working with the dogs as well as people. Are there going to be other dogs there, or is it a regular boot camp class that just a few people bring their dogs to? You want to find one in which the exercises will mentally and physically tire out the dog. Is the class appropriate for your dog? For example, having a Bulldog run and do jumps is not usually recommended; Doga Yoga may be a better option in that case. These are just a few ideas that you can try with your pup. Work up to any new fitness routine with your dog just as you would yourself. Ease him into the new activity slowly. And don’t forget to have fun! 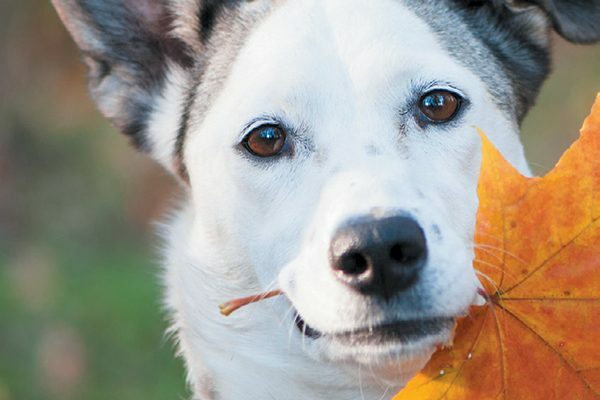 Tell us: What are your favorite fall activities to do with your dog? 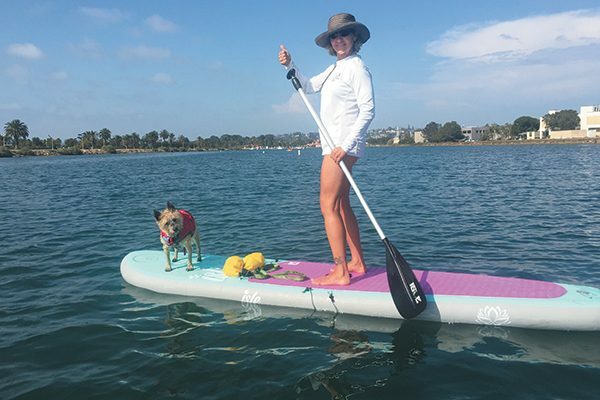 Dawn Celapino is the owner of Leash Your Fitness in San Diego, California, a premier dog fitness company that offers a variety of outdoor fitness activities that include boot camp, dog yoga, hiking, camping, kayaking, SUPing and trail running classes for you and your dog. The post Fall Activities to Do With Your Dog appeared first on Dogster.